Super Riku and Sora. . Wallpaper and background images in the किंग्डम हार्ट्स club tagged: kingdom hearts sora riku kh funny paupu boy superhero. Awww that is sooo cute i might use it to make icons ?!?!?! QUICKLY! TO THE GENERIC OWL CAVE! *grabs lemon* indeed. That is sooooo adorable, and really funny! lolz!! thts cute at the same time!!! OMG look at Sora. LOL, and Rikue looks funny! Ooooh! I wish Sora WAS a Papua fruit so I could eat him up! 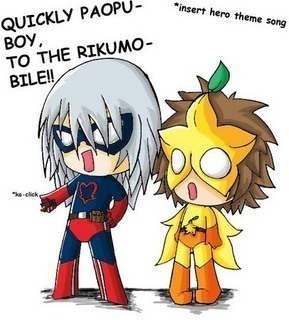 Riku: quickly to to riku mobile Sora:WTF are you on crack again? So freakin cute! <3 it! What? Wait a minute... How come SORA doesn't get his own mobile?